Ordering From Outside the U.S.
As of May 11th, 2018, Augsburg Fortress will be the sole distributor for all Daniel Erlander publications. Instead of ordering from this website, all editions of Daniel Erlander's books are only available to order on the Augsburg Fortress website. Later this year, you will begin to see an expanding collection of new resources that continue the stories and themes established in these beloved books. Augsburg Fortress is committed to stewarding Dan's storyworld into the future. The books written and illustrated by Dan have resonated with readers for decades. Their visual appeal, accessible theological content, and welcoming yet subtly provocative tone invite us into moments of delight, discovery, and the underlying assurance of God's deep and everlasting love for all people. 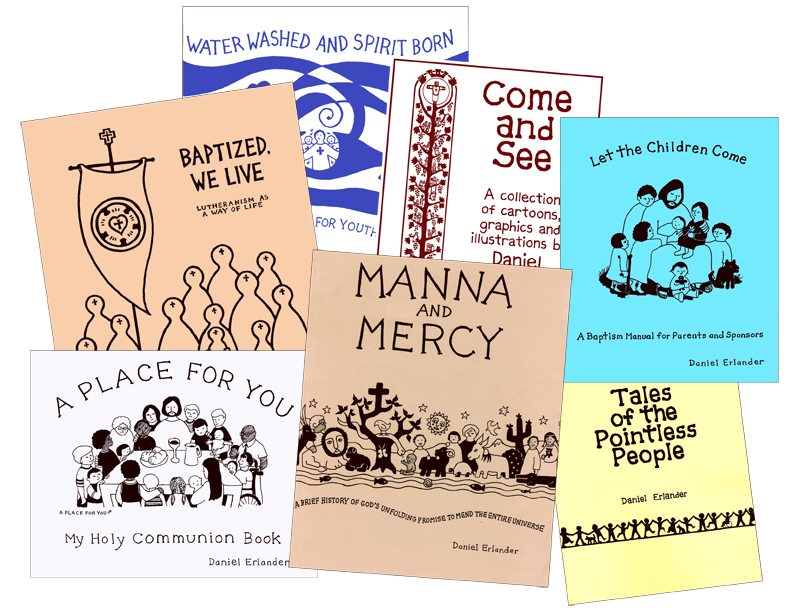 Generations of Christians from around the world can point to these books and tell stories about how Dan's voice helped them better understand what it means to embrace and live out their faith. Augsburg Fortress has committed to expanding on Dan's works in innovative ways, starting with a curriculum based on A Place for You: My Holy Communion Book. Don't worry. If you forget to go to the Augsburg Fortress site, clear links from our order page will direct you to the right place to make an order! And any free Spanish translation PDFs will remain available, as will free resources available on www.mannaandmercy.org.